My name is Randy Miller and I’ve always been interested in bikes, cars and trucks. Well actually anything to do with airbags and lowered “toys”. My dad got me a Honda 50 Trail mini bike when I was 5 years old. I couldn’t even hold it up by myself let alone ride it at that time. It was a big bike for me but in no time at all I could ride it by myself. I ran the wheels off of that thing. Then I got in my dads tools and I started working on it. I would take parts off of it and my dad would have to help me put it back together. He taught me the right way to fix and work on my bike. I was bad to take things apart just to see how it was made and what made it work. The older I got my dad would go to car sales and buy cars. My brother Stacy and I would drive the cars around my papaws hay field. Stacy would lie in the floor board and mash the gas peddle and I would set up in the seat and drive. We would spin through the field and cleaned some ditches out. We also ran through a lot of things but we had a lot of fun. That is how mom and dad taught us how to drive and about car life. Mom and dad would watch us from a distance to make sure we didn’t get hurt or fight over who would drive. At age 14 I got a 1972 185 Suzuki Street and trail bike. Stacy had an YZ80 Yamaha and our friends had bikes too. So we kept the neighborhood tore up. They would call the law on us and we would run so we never got caught. When I turned 16 years old in 1986 I bought a 1973 Chevy truck and wrecked it soon after. I took it apart and restored it and put it back together again. I wanted to do something a little different so I put alowering kit on it. Stacy bought a 1978 Chevy truck and we restored it also. We painted it and put a newcrate motor in it and a lowering kit. Stacy and I got a Suzuki 800 Intruder Bike to play with. My bike was a 1992 and Stacy’s was a 2001. I sold my bike and bought a 1998 Harley Davidson Super Glide. It was not long after I cut the neck of the bike and raked it out. I was still not satisfied with how my bike looked so I made side covers, tach. bracket, cut my rear fender in half and put a 2” band into it to make it wider, and then repainted the entire bike. My friends that I rode with said it was cool and wanted to start customizing their bikes too. I started raking, painting, and customizing their bikes for them. I was carrying mail for the local Post Office and helping my dad as a mechanic. In my spare time I was playing around with the bikes. Stacy got a 1997 Harley Davidson Wide Glide and I raked it for him. 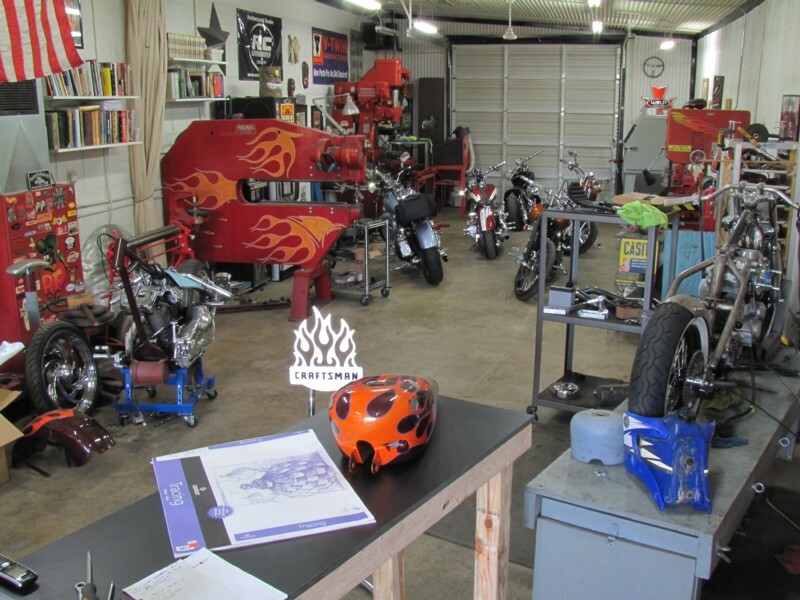 I was watching tv one day and saw Jesse James and liked his sheet metal working style and bikes. In 2001 I had the opportunity to go to L.A. and meet Jesse James and take a tour of his shop. He told me about Ron Covell a sheet metal master. I called him when I got back home and took some sheet metal classes. With the help of Jesse and Ron, I was able to hand make a rear fender from a flat piece of sheet metal for Stacy’s bike. I painted the fender and man did it look good, I was on a metal high. Since then I have made a lot of hand made fenders and custom gas tanks. I wanted to work on bikes full time so I quit working at the Post Office. I started buying old tools and painting them and it opened a new door for me. The more I modified the more I wanted to do and make. I have learned it takes a lot of time to make things custom. I’ve had a lot of good people to work for so far. I had the opportunity to modify a 2000 Road King by stretching the gas tank, stretching the saddle bags and painted it. I have also redone a 2002 H-D Wide Glide. I was very blessed to have that story put in the Hot Bike Magazine. I was blown away that so many people liked it. It just kept getting better and better. I have built two custom bikes from ground up, made a lot of the parts and custom painted both bikes old school style. One of these bikes will be coming out soon in the Hot Bike magazine too. My mind keeps going. I like old Rat Rods/Hot Rods, bikes and cars. So Stacy and I named the bike shop Miller’s Cycle since we have gotten into the rat rod/hot rods. Stacy has a 36’ Chevy truck and drives a 1952 Ford Crestline. I have a bagged 1971 Buick Skylark, a 28’ A model sedan and a 1954 Ford Customline. With new ideas we keep growing our business and also decided to rename the shop Miller’s Cycle & Hot Rods. We are not self made but we are from a life time of being blessed with family and friends that like what we do.